Auckland Transport have announced they are cutting the Newton Station from the City Rail link in favour of an upgraded station at Mt Eden. A significant design change to the City Rail Link (CRL), will save over $150 million, improve the reliability and journey time of train services, minimise construction disruption in Symonds Street and reduce property purchase requirements. 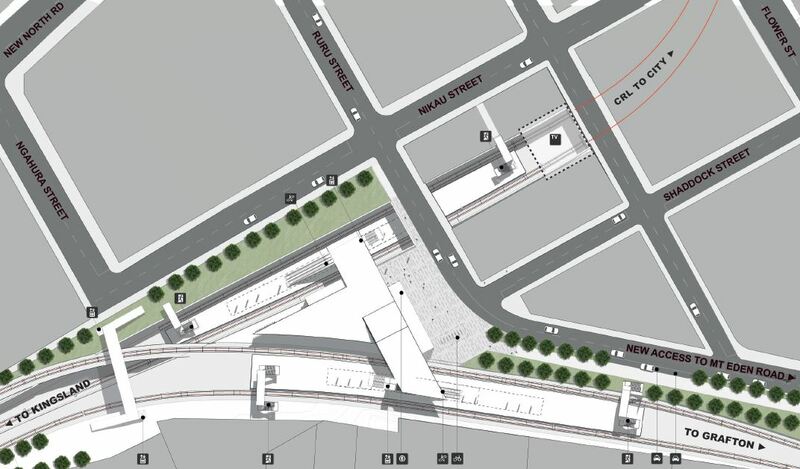 Auckland Transport (AT) has decided to redevelop the existing Mt Eden Station and connect it to the CRL rather than build a new underground station at Newton. AT chairman Lester Levy says that since the City Rail Link’s concept design was developed two years ago, there has been concerted effort to optimise the design and drive value for money. “The change that has resulted from this focus will reduce cost by removing the very deep Newton station, which will also reduce construction disruption in upper Symonds St by 12 to 18 months. Dr Levy says the changes also will result in an improved customer experience with the CRL platform at Mt Eden now to be built in a trench similar to the New Lynn station, and be open to the sky, rather than deep underground as was the case for the proposed Newton station location. This open air location and the separated train junction will also lower operating costs. “This is all good news, at a time when patronage is increasing and people are really seeing rail as a travel choice*. We are definitely moving in the right direction to meet government targets for CRL funding,” he says. In addition, fewer surface properties will be required. Owners affected by the new design have been contacted directly by Auckland Transport about the change. As well as these significant community, cost and service benefits, the development potential associated with Mt Eden Station will not be limited by volcanic cone view shafts and heritage buildings which constrained the Newton location. Changes in the rail track alignment will also reduce vibration and noise effects on surrounding properties and improve travel times. Dr Levy says AT’s on-going design improvement focus included a comprehensive review of all project elements by an international “challenge team” of experts. He says information on the design changes and upcoming milestones for the CRL will be explained to the community at open days in the project area in late August/early September. *The year to June 30 saw a 13.9% increase in rail patronage in Auckland, to 11.4 million trips. Here’s a plan of how the Mt Eden station will work. You can see the tracks for the CRL come in underneath the ones for accessing Newmarket which lead to the station in the trench. You can also see a new road will be built that will connect the station to Mt Eden Rd. Sometimes it seems like we can’t get a PT project without having to add a new road somewhere to appease the transport gods. And here’s an artistic impression of it. Firstly, while Newton station would have been located deep under the main street of the Newton town centre area, Mt Eden station is located about 500m further south by the existing rail line. This shifts the focus of the station, and subsequent redevelopment, to the Eden Terrace area instead of Newton. This no doubt means revisiting various area plans and growth strategies, and probably requires changes to pedestrian and cycle networks and bus connections. Secondly, Mt Eden will be located on the west side of the the new junction, which means trains running from the south to the city via Grafton and Newmarket physically can’t stop there. This is unlike Newton which would have been on the north side of the junction and a stop for all trains using the CRL. So relative to Newton, Mt Eden loses connectivity to the south and gets less frequency to the remaining city stations. Effectively this ‘downgrades’ Mt Eden to being the first suburban station on the Western line, while Newton would have been a proper City Rail Link stations with the same service and connectivity as Britomart, Aotea and Karangahape. The design does however include a second set of platforms at Mt Eden to allow trains to run between the west and south without going to the CRL. It looks like AT plan to make up for the loss of service and connectivity by running extra crosstown trains over the top of the regular lines, more on this below. I have quite mixed feelings about this as there appear to be some good and bad aspects to the decision. First and foremost it’s good that AT have managed to find ways to save money on the project – although it’s not to a level that the government are suddenly going to agree to funding it starting in 2016 like the council plan. The savings which total about $166 million are made up of $152 million in reduced construction costs and $14 million in property purchases. On the latter it means AT will no longer need to buy sites around the station entrance and that the tracks can be moved slightly closer together saving on sub-surface purchases. When I spoke to them they were initially a bit hesitant to say exactly how much the project will cost but they eventually said the non-inflation adjusted price was $2.069 billion which equates to an inflated price of ~$2.7 billion (compared to the $2.86 often quoted in the media). AT are also not to buy extra trains quite as early as planned saving an extra $330 million from the upfront budget. The change allows for a grade separated junction at Mt Eden which can help in reducing delays from trains. The one downside to this is that there will still be five other flat junctions across the network which could cause issues for trains so it doesn’t mean there still won’t be issues. Previously all of the proposed stations were planned to be on a slight grade but now they will be able to be level. They’ve managed to squeeze slightly more width out of the Aotea station island platform. It will now have a slight curve on it and at it’s widest will be about 9.5m wide. In my view shifting the station back to Mt Eden significantly weakens the potential catchment and development potential of the station. It means that most of the land immediately south and within 800m of the station will be the existing standalone houses that are not able to be developed due to the zoning and heritage rules. It also means that the potential developments north of the original proposed station are not as likely to happen as they won’t be in as close proximity to the station. In saying this it also made me think that if we could improve access across the CMJ then it is possible some of that potential growth might be able to be served by the K Rd station which is likely to have a station entrance on Mercury Lane. For their part AT say they think the change in station will allow for development to happen quicker on the large site that will be left after the CRL is completed. What’s more the land in the area bounded by the railway line, New North Rd and Mt Eden Rd doesn’t have the volcanic view shaft requirements on it allowing for taller buildings than in other areas around Newton. All up they say the construction will leave about 2.7ha of developable land almost right next to the station. Further as the council will own that, it’s the one who will get significant improvements in property values from the presence of the station. That fits in nicely with Michael Barnett’s correct suggestion of developing council land near stations to help pay for the councils share of the project. Perhaps the biggest concern I have with this suggestion is that it may lock us in to having to always run West to Newmarket/South trains for perpetuity. With a Newton station it would have allowed us to run a simple network at high frequency with those going to Grafton, Newmarket or other points south doing a quick transfer across a platform. Because there is no platform on the eastern side of the Mt Eden Junction it means people transferring either have to go in to Karangahape Rd – adding at least 5 minutes to their journey – or we run direct west-south services. The problem with the latter there’s not likely to be enough demand to run them at anything other than every 20 minutes which is not turn up and go frequencies. It thumbs it’s nose at the New PT network being implemented by AT which focuses on concentrating service on core routes and encouraging transfers expand the reach of the system. 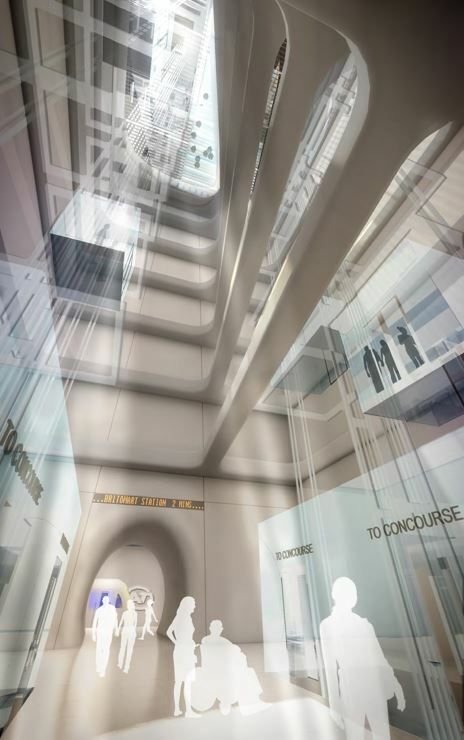 Here is what Newton may have looked like, because of it’s depth it was planned to be accessed by a series of high capacity lifts. So what do you think of the change? Theres good and theres bad but it makes a lot of sense especially considering how close the Newton and Mt Eden stations are. Mt Eden was going to be cut, in favour of a CRL Newton station. Mt Eden was always shown as remaining on all the plans. There is one way to recover the catchment effect all the way to Newton: redevelop a strong, pedestrian- and bike-oriented street grid that effectively rolls out a red carpet from front doors in Newton to the Mt Eden station. Having the station in Newton itself would have made it easier to do with less, but it can still work. I tend to agree. I think there needs to be a bus – train interchange built in as well. Can’t remember bus patterns but an easy transfer from Mt Eden Rd or New North Rd buses would be beneficial. Why would city bound, Southern line, trains run to the city via Newmarket / Grafton? I don’t think this will hurt that much but maybe I’m missing something? I’ve already tweeted you my thoughts. We have a habit of downsizing the stuff we need and going overboard on the things we don’t in Auckland. I doubt this makes one iota of difference to the probability of securing government funding, so overall it seems like a ridiculous waste of redeployed planning and consultation. By all means you could slim down the number of trains if you really want it to be cheaper, but you could always add more later. Making changes to the actual route itself isn’t something that can be changed ‘down the line’. Bad news in my opinion. Why do we constantly need to make cuts to public transport projects? Meanwhile full steam ahead for TG and Holiday Highway. Shortsighted and pointless unless it gets the construction started tomorrow. Forget a redeveloped revitalised Newton. Forget easy transfer from west to Newmarket and beyond. This makes the entire network less effective for a pittance in savings. From the diagram above it looks to me that a transfer is absolutely possible. But instead of transfer from one ten minute frequency line to another you’ll be waiting up to 20 for the infrequent crosstown service. Much less attractive. Average wait for a 10 minute freq service is five minutes. Sure, but maximum is 10 minutes (walking to the stairs as the train pulls away), and it’s twice that with a 20-minute services. People care less about the theoretical mean wait than they do about the practical maximum wait. Especially when it gets up past that 10-minute mark. With this new design is there any possibility of putting in the Newton station at a later date, with reasonable cost? Looks like they will be bringing the tracks through the Newton section closer together. meaning that if the ever wanted to build the Newton station in the future it would be technically challenging, very disruptive and far more expensive. Realistically once the decision is to upgrade Mt Eden Station, newton wont happen. The stations would be far too close on the network. -grade separated junction – great! -less than ideal running patterns and station location – terrible. Seems like a 15% saving for a 30% loss in service. Actually, what am I saying! The grade separated junction wouldn’t have even been needed for the previous scheme! Western line trains would run Newton-West only and the junction would only need to occasionally switch for the odd freight train. AT should have announced their proposed running pattern with their press release. That would clear up a lot of uncertainty. I don’t think you have got that right. The junction which would have been flat but is now proposed to be grade-separated is the one at Newton itself, where Northbound CRL trains from Grafton must cross-paths with Westbound CRL trains to Kingsland. This junction would very clearly have been a point-of-conflict under the original scheme, though not an unmanageable one. The loss of the Newtown station will leave a gap in the catchment of the project and will reduce its coverage of this developing area. Given the high value of the project anyway, to scrimp on this for the sake of short-term political expediency seems very foolish, but sadly typical for public transport projects in this country. Dave, you’re correct, the video clarifies this. And I agree, it makes a lot of sense to have a major station in the middle of an existing centre. Not terribly excited. It saves us about one SH20A or 2 St Lukes interchanges in cost. Just worried we’re compromising the overall performance of the project to make some small savings in costs. National aren’t going to bring the project forward, with or without savings, and Labour-Greens will proceed with the original project as it is. An early start is a good thing and that is part of what AT cooked up with the Govt before telling the Council and other stake holders. The new station (MT Eden) is now and in my opinion will always be one of the least used stations on the Western Line. Even when upgraded it is not connected to the Southern CRL system. On the original plan the projected savings of $100 Million are actually only 4% of the overall cost, hardly a saving at all if they go ahead and upgrade Mt Eden. That 4% is mainly on land purchases and can be gained back after the build with interest on that land sale of sites used for access. Remember once it is built wrong it can’t be undone by just adding a Newton Station back in because the track alignment is different. Short-sighted, cost-driven, anti-urban and counterproductive to an effective operating schedule. They wouldn’t think of doing this sort of mindless fiddling if it was a motorway, would they? It’s not going to improve things and the saving is minimal. You really do have to wonder what stakeholder they’re trying to satisfy because, if it’s the current government, they’re never going to succeed. It’s a 4-lane Auckland Harbour Bridge ‘solution’ and it won’t work. A very short sighted move in my opinion. The old location was at the crest of the hill and allowed for an easy 500m walk around Newton, It’s catchment easily covered the existing employment and residential centres along Khyber Pass and throughout the area. It was the logical centre for Newton and it would have encouraged development in the area.The Mt Eden station is tucked away in the valley and creates a tough up hill and longer walk. This seems incredibly short-sighted unless I’m missing something. With this downgrade you can’t run trains from Karangahape to Grafton under this scheme, which means frequency on the CRL has just dropped dramatically, as a portion of (or worse, all) Western line trains will need to go via Newmarket? Anyone have any ideas on a reasonable train pattern under this scheme that offers anywhere near the frequency of the original scheme? Ok, so the eastern spur comes off at Karangahape to Grafton still? Is there a map about with the new tunnel routes? I guess this means if all western trains go via CRL, then transfer for Newmarket needs to happen at Kingsland, which has only 2 lines on it, so much reduced frequency/timetable running. Not sure what you mean? The big change is that because it’s south of the portal there is no transfer possible at Mt Eden to trains leaving the CRL and heading to Grafton, that is still possible at K Rd, but what is clearly intended is that west-south riders change at Mt Eden [or earlier] to a new west-south service. This is to where where the down side is, because it isn’t clear how frequent such a service could be, and that the pattern on the west would have to be spilt and therefore lose frequency….? However, a really important ingredient into this change is the question of what pattern the New North, Dom, and Mt Eden buses will now run? will one set of these now head down Khyber Pass to Newmarket? Say the New North Rd buses, so as to offer a different destination than the city where the really fast train is heading? That is certainly an option…. Gold plated roading projects. Bronze plated public transport projects. Time we changed the Govt. Thanks Jon. Whichever Government is elected, they’ve promised to do this (National later than the others). Keep the pressure on, particularly if NZF has the power. NZ First committed to construction starting in 2016 LATEST under its “Railways of National Importance” programme. Come to the Transport Debate being organised by CBT on Aug 27th… NZ First will be there, Labour, Greens too but who knows if Nats will turn up? Will NZ First 100% fund the CRL? That would legitimately swing my vote. Mixed thoughts about this too. The savings don’t seem that big. AT really need to break out the cost of the project. Now would be the perfect time to state the cost of the tunnel only, so we can bury the $2.8bn myth once and for all. My preference is to build the original plan in stages, much like you would a road. Cam, we were given the figure of 2.069 billion yesterday at a briefing. I believe that is for tunnels, stations, enabling works, property purchases [many of which are assets, of course]. In other words everything needed for the project. What I am not clear on is the odd business of inflating the figures, which only ever seems to be done for this project and never for m’ways costs, so I can’t say what year’s dollar this is in? Excluded were works elsewhere such as improvements Onehunga line, the Mt Roskill branch, a Third main, Electrification to Pukekohe etc, which are all nice-to-haves, but are not necessary for most of the benefits of the CRL to be realised. Also not included are additional trains, as a full running pattern is possible with the 57 we nearly already have. That was our conclusion for our favoured running pattern and it was confirmed yesterday by AT’s CRL team for theirs. It does mean mostly running 3 car sets with a limited number of six car sets at peak. 18 trains an hour through the CRL [each way] nearly a train every three minutes, many other stations getting 9 or 12 tph, a good high level of service. Including semi-express peak services from Papakura via the eastern line. Frankly I have always thought additional trains are another issue, especially as they represent a means of staging the project, in the sense that they aren’t needed till they’re needed. If we find we need them sooner than planned well that can only mean that the project is a huge success and booming [which I am confident it will], which will also mean that the return from fares will be at the higher end of the scale and funding an additional 24 [the proposed number] will surely be straight forward. Furthermore it also means that the economic benefits of the project are being realised sooner and so on. Next step from the CRL team is information on how the project is to be staged. I expect this will also contain good news about spreading the capital cost and minimising disruption. Matt – I am still confused by the new running patterns (and I don’t think I am the only one). So will Western line trains still be able to go into the CRL tunnel to K’Road – Aotea – Britomart? I assume Southern Trains will still be able to go via Newmarket to Britomart and then through CRL tunnel to K’ Road/Mt Eden? Am I right in saying that the problem is that Southern line trains now won’t be able to travel Newmarket – Grafton – K’ Road – Aotea? So if people wanted to e.g. New Lynn – Grafton, they would have to wait at Mt Eden and change to a West-South train? And same thing if people want to go Remuera – Grafton, they would need to change at Newmarket for West-South service? I know I have gone on about this in the past, but I really feel the direct West – South (missing CBD) route will be more popular than you think. I believe AT could sell that route to a lot of people who go from West to South (and vice versa) to work/play. It always amazes me how many people live in Auckland and never come to the CBD. Those people may well see that route as a big positive. That route includes a lot of major employment centres and with more intensification around stations (especially in West) more people will be within walking distance. I reckon it will merit 10 min frequencies quite quickly. All *running patterns* can be as before – all flexibility stays to do them. However, any services that include a direct Grafton-Aotea route will miss out on any stop at mt eden/newton – the eastern leg of the triangle doesn’t have any stop. plus possible west-south service; say Hendo-Otahuhu at 3 tph. Removal of Newton means southerners get a quicker trip to city via Grafton and that way also avoids the loop round the back of Vector for a higher number of trains. OK so Southern line trains still go through Newmarket but if I am on a Southern line train and want to go to Britomart, I will need to stay on and go Newmarket – Grafton – K’ Road- Aotea – Britomart? So no Southern line trains will keep current running pattern of Newmarket – (Parnell) – Britomart? Am I on the right track (pun intended)? So it means a longer trip for Southern line travellers to Britomart? I don’t necessarily think that is a huge problem, I just want to understand. And then the Southern line will loop back out on to Southern line (via Parnell – Newmarket) or Eastern line? No trains will terminate anywhere in the central city. And as far as we know, there’s no plan to use the CRL as a “loop” – every service links two separate lines running in both directions, instead of making a one-way loop and going back the same way. Southern line trains will go through the CRL from Britomart and continue on the western line, and/or go through the CRL from Grafton and continue on the eastern line. Look at the bottom map here: https://at.govt.nz/projects-roadworks/city-rail-link/city-rail-link-route/ – the red, green, and blue lines show all the possible ways to route through the tunnel, although you can obviously also change where they terminate, which ones go to Onehunga/Manukau/Mount Roskill etc. The map’s a bit misleading now, though – the blue line looks like it stops at Mt Eden, but it doesn’t. Yeah I have looked at that map now and answered my questions. I think I have summarised new running pattern in my latest comment below. Looks good – excuses all gone Big Gezzer! Let’s get it done. Goddamn it, if you come out before election and announce a 2016 start date, I guarantee you one more party vote. Otherwise (*gulp*) NZ First it is. I feel dirty. I must say, seeing Jon Reeves is a NZ First candidate has raised the party in my estimation. He always has sensible things to say on here. Jon, you are a better man than me if you can cooperate with Andrew Williams. There must be little you agree on transport wise. goosoid, if transport is your priority, surely it’s either the Greens or Labour? Julie-Anne Genter would make an amazing Transport Minister – imagine having someone who actually understands the economics and mechanics of transport in charge. Phil Twyford would also do a great job, he seems on the cutting edge of Auckland mobility issues. Neither even deserve to be mentioned in the same breath as the current minister. They’re both on a different plane. I agree that a West-South train will be increasingly popular with the growth of housing out west. Not all the new residents will work in the CBD or attend Auckland Uni. The next big issue will be how to catch a train from Kumeu. Need a system map to visualise this. AT won’t release them yet for some reason. They still don’t communicate as well as they could in our view. Too much rather fearful secrecy. What rational reason could there be other than there’s something about this they’d rather we didn’t know? Nah; just institutional issues. Arse covering, people not wanting to take a decision they might be criticised for…. Is there any possibility AT was told to get the price below a certain level and then the govt will bring forward funding? Or am I thinking too logically here? Well if it was me I would have said get it below 2bil, so they’ve failed if that was the case! Nah, this is it. KRd is well supported and vital. Is there any clarification on Aotea staion being the future station for transferring to the north shore? Hope AT are putting that in their comms as they should be highlighting rail to the north. Yes. And head of NZTA confirmed to me, verbally, that the AWHC designation includes the rail line from Wynyard to Aotea. Which is great and real future proofing. That’s both unexpected good news and extremely typical. Excellent money saved than can be spent on Penlink instead ! You have got to be kidding right? To serve roughly 13k vpd? $200M. Oops. Apparently I made an error on the projected price for Penlink. It’s now in the region of $300 – $350M! So can this be done within the existing designation, or do Auckland Transport need to go through the Notice of Requirement process again? Aside from the other faults with this, what if we do get a change of government that funds the CRL immediately? We may have added another year or more before it can open. On the other hand, the crosstown shuttle doesn’t need to be low frequency. If it just shuttles back and forth between Mt Eden and Newmarket it might be able to do the roundtrip in 10 minutes? Actually I think this speeds up the project, think it is all within the existing designation, it’s been in the works for quite a while. It certainly makes for a much more straightforward built. As for the shuttle that is clearly a way to improve frequency and cut opex on that route, until such a time as the CRL is full and there’s still demand on the western, in which case, might as well run them up the line, say to Mt R?. If it is run as a crosstown shuttle then perhaps it could be high frequency, but that would also mean people going west/south would need to make two transfers (one at Mt Eden and another at Newmarket) making the service very unattractive. Seems crazy not to put an interchange station directly where two high frequency lines meet. I’m not as down on this as I though I would be. If we look at the old map, we see that the area will still be overlapped by Grafton, Karangahape, and Eden Two. People wanting to access the area will have either Grafton or Eden Two to use, and those wanting to access the city from a Grafton running pattern will have the option. It’s 95+% of the solution for 90% of the cost. It’s quite galling that public transport projects get cut while roads are plucked from thin air, but this is a cut which has minor impacts, and may help get this into operation a year or two earlier, which will have significant impacts in improving and transforming this city. Let’s not forget that just a few years ago the CRL was just a concept. Now it’s very close to being a reality. Pretty much my view too. I do think this makes it much more realisable sooner. The development gains are also much more likely to be delivered on down in the valley than up the hill, which still has to try to overcome the dis-benefit of the Newton and Symonds St traffic sewers. While I’d also join this consensus on Mt Eden’s redevelopment potential, I don’t think it escapes the traffic sewer problem of Newton and Symonds St. Those areas are still comfortably within a 500-2000m bicycle catchment and a 500-1000m walking catchment, and so would remain a major feature in the CRL story. That the nearest station is now further afield only makes it more necessary, in my view, to provide a decent street environment for last-mile, non-motorized travel in this area. Newton Station would have overcome some of the street design dis-benefits by sheer force of proximity, possibly allowing AT to get away without substantial street improvement, but that mitigating factor is now diminished. Call it naivete, but I don’t believe that sorting out the traffic sewers is that difficult (even politically). It can and should be done, now more than ever. I agree, along with the severance issues caused by the CMJ. There is now clarity that these must be dealt with at surface. I would love to see the space between Upper Queen and Symonds Street covered over with a nice urban park, and connect those spaces together. It would make a massive difference. Non-motorist and Patrick, exactly. The onus is now on the surface street redevelopment to make the area more attractive for pedestrians so they’ll walk a little further from Mt Eden. There is so much potential in this area, really making life better for pedestrians (not to mention buses – bus lanes in this area are way overdue) could be a silver lining in this move. I was just thinking that the Waitemata Local Board must be spewing that the loss of the Newton Station undermines their Newton area renewal plans… but with luck adjustments can be made to make the best of it. I do wonder if these changes in service design, routes and frequency will be easily understood by the everyday commuter. It seems a real shame to lose to flexibility and connectivity that the previous design was looking to achieve, all for a fairly small saving. It does look like a political play so I will be AT kudos for trying to tackle this as a compromise to try and get this across th line with the Govt, but it does appear to show a lack of understanding of the network scheduling and service delivery implications long term. A sorely missed opportunity, but hopefully one that pays off with a magic “YES” from the Govt. No I think it’s a war of attrition, and this is one more blow. The CRL is inevitable, and AT are doing a great deal to develop an irresistible case for a 2016 start. They are doing this well in my view, largely. The programme for staging construction will be the next play. Another penny-wise/pound-foolish public transport decision. As others have noted, i don’t think this will make a shred of difference to whether or not the government changes its mind about supporting the CRL. It will however impact on the ability of PT users in the South to get to K Rd and surrounding areas. Southern bus services to uptown will be peak only so this change will leave a significant gap in the promised service upgrade. Once again we are faced with a situation where Aucklanders have voiced their preference for more and better PT, yet PT projects get trimmed to save relatively small amounts (the ‘saving’ on new trains is just cost deferment) while the region’s decision-makers are perfectly happy to spend $5 billion on a second Waitemata harbour crossing. I can’t see that there’s much to love about this proposal. Is there a map of the proposed running? The CFN’s running patterns were nice and simple, but it’s less clear that they’re the way to go without the simple transfer at Newton. With southern via Grafton I’m guessing South/East, West/Onehunga, Mt Roskill /East? I don’t think the south-west platform is particularly useful. A platform on the line out of the CRL going south would be good for transfers thou, even if it is a 2 minute walk. That map suggests the possibility of transfers from Grafton/Kd at Mt Eden (blue line), which doesn’t seem doable as there’s no platform on the eastern (blue) line. If that was still possible, then I’d have no problems at all with the change. Seems they’ve just modified the Newton picture by changing it to “Mt Eden” without updating that the blue line curves off before Mt Eden station. Yes, but surely a variety of running patterns are possible? You can run Eden Two – Newmarket services, which make the Southern Platform useful. Some clarity will be needed. You could, but then you’re not going via CRL, so one less train on that link. It’s OK if there’s enough other trains running on that link ofc. George yes service pattern maps are needed in the public domain, but here’s to them presenting them well, not too technical, not too vague. But the essential thing about this planning is that because the CRL changes everything they mustn’t be too proscriptive. Even before the EMUs and just with station upgrades we are seeing big shifts in use. I have always said that this project is transformational, like the Harbour Bridge was, and will change a great deal for so many so predicting demand is a pretty tough gig. We have long maintained that the best pattern is both as frequent as possible and as flexible as possible, or rather as flexible as possible by being as frequent as possible. Facilitating all sorts of peculiar use on the networks while clearly meeting the main demand corridors. Trusting that people will intelligently make transfers where that is rational. Now we are already seeing that happen at Panmure, Grafton, New Lynn. With higher frequencies, the New Network, and more interchange stations that habit is clearly about to go mainstream. It is best to get the frequency up as high as possible as soon as possible then add capacity with longer trains to match demand as it grows. For example it is likely that the number of western liners currently using Grafton will shift to CRL, because many seem to be using it to access the city now, but also that station is still likely to grow in attractiveness itself as the Uni Campus there grows…. This is not able to be modelled. It will be fascinating to watch. Even a two minute walk can be a big deal for passengers with armloads of luggage going to and from the Airport. Won’t this affect the possibility of single-stage journeys from anywhere around the network to the (eventual) airport link? So it appears from that map the Southern line will go via Newmarket/Parnell to CRL and then out on Western line. Onehunga line (skips Newmarket?) via Grafton (skips Mt Eden?) through CRL and out to Eastern line. Western line to Mt Eden through CRL and out on to Eastern line. Sounds good to me. Plus also maybe a West/South line straight on Southern? I still say that is a potential quiet achiever. Symonds Street is pretty much bang in the middle of K’ Road and Mt Eden stations – 800m from both. I understand that 800m is considered the maximum comfortable walking catchment (approximately 10 min walk). Less than 5mins by bicycle according to Google. If we can just improve street environment and put in some separated cycle paths, that should make all the area a catchment for Mt Eden/K’Road. Once the Beach Road separated paths are packed with bicycles, AT will be building them everywhere! And we will all be complaining about bicycle congestion – Now that is a traffic problem Auckland would love to have. That’s an old map, Southern goes via Grafton to benefit from absence of Newton and to avoid slow dribble around Vector, and Britomart junction with eastern. New flying junction at Mt Eden, fewer conflicts. The Southern line will go via Grafton (skipping Newmarket/Mt Eden) into CRL and then out on to Eastern line. Onehunga line via Newmarket/Parnell/Britomart into CRL and out via Mt Eden on to Western line. Western line into CRL via Mt Eden and out on to Eastern line via Britomart. OK thanks Patrick. Glad to hear that because I understand currently a lot of Southern passengers get off at Newmarket. So slightly longer journey for Southern passengers to Britomart or can change at Newmarket to Onehunga line. Shouldn’t be a major as frequency is freedom. Get it done and let’s have a proper city before I am too old to celebrate it. I hope my daughter can grow up in a proper city with a proper transport system. But a quicker one to Aotea which is really the heart of the city and the biggest destination. Looking at the video, there could be no Eden station for south running trains as the bored tunnel probably extends most of the way to Grafton Station. Good to see the underground section is fully grade separated. The $150 million saving should be compared with the present value of future extra running costs of operating a west-south service which would not otherwise be needed. Triangles with a service on all three sides are generally inefficient because because frequency ends up being either inadequate on the sides of the triangle, or more than needed on the arms that extend from the corners of the triangle. Much is made by some of the “400 metre uphill walk” from the upgraded Mt. Eden Station to the Newton site. But who says it has to be a walk? A series of escalators &/or people movers via new public squares and on a fairly direct route should make this transition much less arduous. As I envisage it most of Eden Terrace is up for comprehensive development so we are talking about a largely clean slate to design a new town centre – with high priority for pedestrian links through the site and between levels. Not stated in the debate is the genesis of the changes at Newton. A panel of international experts was convened in February to do a reality check on all aspects of the CRL. This was the most significant of a number of recommendations (eg. changes at Aotea station) that have been worked through over 5 months and publicly announced today. Although it is very convenient to have some cost savings, I do not believe that to have been the driving force. >> Much is made by some of the “400 metre uphill walk” from the upgraded Mt. Eden Station to the Newton site. But who says it has to be a walk? A series of escalators &/or people movers via new public squares and on a fairly direct route should make this transition much less arduous. As I envisage it most of Eden Terrace is up for comprehensive development so we are talking about a largely clean slate to design a new town centre – with high priority for pedestrian links through the site and between levels. Excellent point. The neighbouring sites are ripe for public realm redevelopment, and escalators etc. would be perfect for the context. Looking at this another way, if the CRL was never going to happen and Mt Eden Station was to remain as is, these would still be important enhancements for the station, the street and the catchment. A redeveloped station with better service due to the CRL would only further motivate such improvements. Graeme, very happy to hear this. Learning from the best is exactly what we should be doing. One of the things I notice is that because I’m not using a car as often, my fitness and desire to walk places to get to where I want to go has increased. If we expect as a society that people will a little, is that a good or a bad thing? So long as options are provided for people less able to walk, great. I dont mind losing newton station as i wasnt a big fan anyway. But my question is if they are not going to have newton station underground then why are they tunnelling all the way to newton.? That point is the highest point no?. The whole crl grade will be steeper to meet the existing line there than anywhrre else. If you are not going to have an underground newton station then surely it would be easier/cheaper to go somewhere else. I agree with a few om this blog that ian mackinnon dr is over engineered. Just tturn the trains down thete and take two lanes off it for the tracks. Demolish the big interchange and sell the land to make a nice transit oriented area and help fund it. Whatever the option. If there is no underground newton station then why on earth are they tunneling to the highest point? It’s not a tunnel to Newton it’s a tunnel to the western line. That’s the whole point. To link the networks together. Newton is just on the way. A useful point on the line. But surely if the tunnel went to the west a bit it would be surfacing in a much lower area. Newton rd is very steep. The Ian mackinnon dr area is much lower than the top of khyber pass and symonds st. So if the tunnel was to the west it could either surface earlier or perhaps the steep grade of the crl could be reduced. Either one would be of benefit. The western line is right there next to the ian mackinnon dr/ new north rd intersection. There are also not as many properties in that area to destroy what with the big junction already there. Another potential saving. But if the tunnel went to the west a bit it would be surfacing in a much lower area. Newton rd is very steep. The Ian mackinnon dr area is much lower than the top of khyber pass and symonds st. So if the tunnel was to the west it could surface earlier saving costs. The western line is right there next to the ian mackinnon dr/ new north rd intersection. The geometries are tight and they’ve taken the most direct route to get up to the western line, while accommodating the most valuable station locations. A part of this change does help with the incline. Rest assured if there was an easier route it would be being used. There’s no before and after here, but this shows that they’ve taken some steepness out, because Newton required a flat platform, thus making the bits on either end steeper. Now there is just a continual grade up to the surface, where they’re building Eden Two. None of the platforms were flat before, even already was on a slight angle but the changes mean that all will be now flat. Could it be that AT realized that it wasn’t going to come in at the $2.8 Billion figure, so they’re reducing the cost now so the final cost is still well below the $2.8 B, though with less to show for it. Just thinking out loud. Sorry for double posts. The website says my comment failed to be published so i try again. On the map above imagine an additional Henderson to Otahuhu via Grafton Line, and that’s it [minus the other future work]. It’s got its good and bad. Still need to get more info. I think a major redevelopment at Mt Eden is a good thing and will revitalise that area. I would be all for it if it meant that construction started today, but since it wont matter than I’m not that enthusiastic…. The block between Nikau and Shaddock appears to be such an opportunity. Note the Tunnel Ventilation (stack?) beside the CRL platform. This would need to be incorporated into a building, although it should be in the centre of a block and not in road frontage. And still need to allow for diesels on the NAL. I wonder what the height limit above the station site is to the Mt Eden view plane? A larger development and buildings wouldn’t require so many small roads, which could free up more land area. There would be two as it would be at two levels as the To Britomart and From Birtomart tubes run at different heights i nthe diagram (presimably for alignment and the need for the To Britomart to dive under the existing Western line to avoid the level crossing. (the eastern end of the Mt Eden West station would be where the concourse to the Mt Eden East station links so that you can move from one set of platforms to the other without leaving the station. See the video about 1:37 you can see the “end on” view of Mt Eden with the tubes for the eastern CRL link in the distance. Yes it will add cost, it will be a bit squigly but won’t have the need for Western/Southern link trains as you’ll be able to then substitute Mt Eden East/West and your “Newton Station” transfer point. And there are a few station on the London Tube which have linking bits (Bank station springs to mind). Doing this would raise the issue of Grafton, but with electric trains the “hit” from an extra stop at Grafton as well Mt Eden East would be minimal overall, compared to the hanging around waiting for the Souther to Western link trains to turn up. But in my mind this would erase much of the bad of the design, and as AC would own the land around the stations they would use the uplift to fund more of it. I was thinking the same thing. Wouldn’t cost much at all cut n cover method. Also as you mentioned they use this a lot in London and it works great (especially without stairs). I personally didn’t like the idea of such a deep station with lifts. Also good that they get rid of a junction with tracks crossing each other and have them totally separated. But does that mean if you are coming from the Southern line you can’t get off in the symond st/newton area? It’s either Grafton or K’Rd. I quite like it, it will be great having a proper grade-separated junction station. The retention of Mt Eden also implies they will be doing what I have long suggested, looping trains back to where they came from. I.e., West-Newmarket-Britomart-CRL-West. This will ensure Western trains offer a selection of services that run to Newmarket first in addition to those that run direct into the CRL. Under the old plan, Newmarket passengers would have been forced to transfer, making it slower than current times. Nope we won’t Geoff, wrong again. No loops. Well obviously they are planning for this to be a major interchange, which means a lot of trains running west-Newmarket. Unless they make them all crosstown trains that avoid the CRL, they would have to loop some of them? West-Newmarket-Britomart-CRL-West running pattern would not be ideal and is very unlikely to happen if AT has any sense at all. One of the big advantages of the CRL is getting rid of the direction change at Newmarket for Western Line services. In relation to the new streets surrounding the station: it’s great to have some extra connectivity. But surely the majority of these can be pedestrian laneways and/or shared spaces rather than standard boring car-orientated streets. Design it for pedestrians and cyclists – inner city stations don’t need car access from every direction. Savings of 166 mil could be spent much better elsewhere. I think Newton would be a better option but not 166 mil better. I see that f**kwit Quax is back mouthing off against the CRL on the radio just now. Will there be a candidate to oppose him in the next local body elections, so that we don’t have to deal with his ilk in the future? That seems disappointing…3 different services along the inner Southern but only 1 on the Eastern and outer Southern. And having the red line serve Westfield to Puhinui twice is just asking for confusion. Also interesting is that Te Mahia and Westfield are still included on the map. Does this suggest that AT expects them to be kept or is it just that no final decision has been made yet? I can definitely see that in the short-medium term, Mount Eden is a better location for a station than Newton. However, once Newton begins to redevelop with some decent densities, I think that a station there would be extremely beneficial. So, does the new plan make any allowances for the future construction of a station at Newton or do the changes mean that it will be physically impossible to build a station there in the future? No Newton would be impossible to build later. Impossible because of the expense or impossible because there would be no space for station tunnels to be constructed? Note that the Blue line comprises different frequencies at different points. The O-Line is limited until upgraded with at least passing loops, so the bulk of western line trains will terminate at Quay Park. It is clear to see how this pattern is ready for that upgrade and extension of the line through Mangere and the Airport. The purple line is only 3 trains per hour, and could flip into a Mt Roskill branch service as the main western increases frequency, or head through the CRL to Panmure, say. After all the CRL so changes everything that no one knows what the demand picture will be like. Flexibility through frequency. Cool, thanks. I would question whether or not the crosstowners would be more valuable going to Otahuhu as opposed to Parnell and Britomart. Having them go to Britomart and into the tunnel would at least ensure all Western Line trains will take you through the tunnel as you can never pick the wrong train, but have the option of running direct to Newmarket if you need to. Having Western line trains terminate at Quay Park rather than say the bay at Newmarket is interesting. There would be a poor service frequency for Parnell and the faster way between Britomart and Newmarket. My view is that this is a rapidly changing field already, and we haven’t even rolled out either the new trains, new bus network, nor integrated fares. So what the picture will be like post CRL is really a wide open field. The main thing is that AT have a legible service to promote, yet a flexible enough infrastructure programme to be able to tailor service to the unknowable and evolving demand patterns. With that in mind I’m serene about the proposed pattern above, what we end up with will almost certainly be different. Agreed, Patrick, at least there IS now a proposed running pattern to talk about. It was mad that the likes of Transport Blog had to propose them in absence of concrete suggestions from AT. FWIW I’d personally rather not have to rely on the crosstown line, but the key is to remove the Newmarket reverse shunt and de-emphasise the slow crawl around the Vector Arena, and this pattern achieves this. Progress just in this, and the more we talk about it the more we can surely achieve. Wouldn’t it be better for consistency/legibility to have the blue line run to Otahuhu, and the purple line go to Onehunga via Grafton. The area around Onehunga and Te Papapa almost certainly employs more people from West Auckland than either Westfied or Otahuhu, and those travelling further south can still easily transfer. Okay, the grand plans for the Harbour Bridge with a railway and a walk way were cut to a 4 lane, car only mess> Then Britomart with its combined bus station and more room for trains and adjoining underground walkway to the ferries was done on the cheap too and both have been spectacular small minded failures when it comes to realising the potential they could have brought, Britomart so much so that we now have the CRL as the solution to fix the stuff up its become! And so Auckland’s leaders have taken a leaf our of their forefathers book and guess what, that solution will now be done on the cheap. But it will still cost a fortune and not achieve what its goals were supposed to be. Learning from history seems too damned hard and its much easier to simply repeat the mistakes. Unless this is done properly do not do it at all! Because of the timing it seems like a cost cutting measure. But those grade separated junctions really give an improvement to speed and reliability. Personally, this morning when it was announced I hated the changes. After learning more throughout the day I came to prefer what is now being proposed. Although not convinced about the 3 tph purple line though – it will be much better when it’s able to be upgraded to a higher frequency. To change from the Western Line to the Southern would take about 2 minutes more at K Road than at Newton. K Road is 800 m north of Newton, so at 60 km/hr in each direction this is another 1.6 minutes to back-track 800m. For most passengers it would be quicker to change at K Road than wait for a purple line train. The purple line is a nice potential operating pattern for times when the blue and red lines are overcrowded, but the time savings involved would be minimal. Initially there might not be enough trains to run the purple line, but it’s a good route to have for times such as sporting events. Exactly. Purple isn’t needed. Let’s wait and see. Agree, West to South transfer at K Rd station would, as Malcolm says, be only a couple of mins longer than it would have been at Newton. Probably much better than waiting up to 20 mins for the purple line. And the 1-2 mins of time savings to Aotea/Britomart for the larger number of Southern to City passengers by having one less station to stop at probably justifies making the West to Newmarket passengers journey slightly longer. I’m a big fan of the CRL, was at first disappointed on seeing these changes, but on looking further this evening I now think these changes don’t detract from the quality of the solution at all. The additional grade separation under Newton will be important, I’d taken it for granted that was part of the original plans. And delaying the train purchase is smart: I’m guessing train delivery has a shorter lead time than the CRL construction period. So if/when passenger levels on existing lines show 57 trains won’t be enough to service the CRL, there could still be time to order trains mid-construction period to arrive soon after the CRL opens. I think excluding the cost of the additional trains from this project was a wise idea, wether it was with Newton station (or the former plans) or not. It’s like a building a motorway and including the cost of the additional cars that are going to use it as part of the original project case, is simply absurd. * Would it be useful to keep Purple Line trains for the peak period, at least? * What is the feasibility of running west-to-south trains before the CRL is completed but if Britomart has hit capacity? (Ie is there enough peak traffic going into Newmarket to make these trains work? – any passengers on these trains who were going into Britomart would not have overlong to wait at Newmarket for a train into the city). There’s probably more of a case for west-south pre CRL than post, precisely because of the capacity issue at Britomart and the lack of a direct route to the city from the west. Basically if there are trains and demand but no slots at Britomart then additional western services could run south, or perhaps the Onehunga service could head west, and standard western line services could skip Newmarket? Depending on what the NM junction can cope with this could increase the frequencies on both the southern and Western into Britomart, and the speed on the western (no NM) by 3 minutes. The three main lines could then divide the 20-24 Briomart slots between them meaning potentially up to 8 tph. Onehunga users might not be so happy, and perhaps there’s capacity to run the these new services to Otahuhu in addition to current Onehunga pattern, but that looks pretty crowded, though when the new bus interchange station opens there it will become a significant point as Panmure now is…. 21tph at Britomart so still a couple of slots for express peakers on the eastern line from Papakura. Could always run the Purple line to Panmure and allow Eastern passengers easy access to Onehunga, Penrose, Newmarket and West Auckland? Thanx for the comments. I appreciate that CRL should fix just about everything; but given the likely growth in the system until then, we do need to do some thinking, now, as to how we can manage any more growth once Britomart in its current configuration is full. One idea, would be to run some western line trains to Britomart as expresses between New Lynn and Mt Eden, thence to bypass Newmarket; these would catch up with a west-to-south train, which would have collected more passengers for Britomart, but who would change at Mt Eden. This would speed up west Auckland traffic into the city proper by several minutes, while using another service to act as the ‘local’ train for journeys from New Lynn to various western line stations, like schools traffic, and Newmarket and Grafton itself. Having read the posts here and reviewed the design, I can see merit in the change. After all when was the last time NZTA trumpeted how they saved a few hundred $ on a $2B motorway something or other – no they’d trumpet how the **same** money was used to get a much better solution. And it is also incumbent on AT to avoid precluding future enhancements to CRL and/or changes to the design/running patterns once its built. 1. Provision during construction of the CRL link “cut and cover tunnels” at the Southern portal to allow for a future “Mt Eden East” station linked to the proposed new station via underground walkway, and also provision of links from Mt Eden East to the surrounding surface streets when Mt Eden East is built. AT May not build this tomorrow but eventually it or something like it will be needed so lets do what the original CMJ motorway builders did at K’Rd and build it provision for all of it from day 1, even its an uncompleted station box its still there if needed. It will be cheap to leave it like that for 5 or 10 years and then finish it off than try and shoe horn it in now. It could still be built further down the northern slopes/hill closer towards K’Rd Station, nearer to say the Upper Queen St/Beresford St area, the natural drop in elevation at that point compared to the top of the hill at Symonds St/Mt Eden Road will bring the station platforms 20 metres closer to the surrounding surface – it will still be a deep station, similar to K’Rd having to dive under the CMJ, but it could be built there as and when needed, and so should allow for it in the routing of the bored tunnels so they diverge a little so they can put in an island platform at a later stage. 3. Do something with the CMJ canyon – fix up the lack of crossings or cover the CMJ over fully around Upper Queen Street, at the very least to allow easy walking etc links from K’Rd and K’Rd station precinct to the Newton area. Doing all of the above would not significantly be much more than the 7% or so “saved” so far by the changes and dropping of Newton Station, but would allow for a superior outcome both in the short medium and longer terms. So we’d get a greater outcome – for the same $. And this is merely thinking like NZTA’s road builders – stage the build out, but design it in at the start and cost it accordingly, so only the “initial” phase is presented. Why is a “Mt Eden East” station needed when Grafton is so close? Quite different catchments. Close stations are good nearer the centre as habitation is more dense and barriers tend to be strong. In fact my favoured solution to this area was a ‘Dom Rd’ station between Kingsland and Newton, to serve this catchment and connect with buses. Essentially to move the Mt Eden station to under Dom Rd where the track currently is there [and fix that intersection]. Cheap surface station, but under the road, and one that would have good connections to the dormitory areas on both sides of this arterial. This new solution is an attempt to do that and Newton’s job with one combined station, but as it has no east facing platforms on the CRL line it can’t replace that function of Newton, but it is certainly cheaper and faster [ie one less stop each way]. This would add another Western line stop but the catchments of Kingsland, Dom Rd, Newton and Grafton, would still be separate and complimentary. And no case then for a west/south pattern. Why would you not, it allows easy (walkable) transfers via the Mt Eden West/East station pair for those who come in on the Western trains and want to go South or to Newmarket without necessarily going to K’Rd Station first (this basically makes these two work as per original Newton station would have worked). This saves 2+ minutes of in/out journey time plus avoids the need for those clunky shuttles from Mt Eden West to Newmarket for those who want to go to Newmarket from out West. And its a 1Km (flatish) walk from Grafton to the proposed Mt Eden “West” station which is the same/similar distance as Grafton is from Newmarket. Mt Eden East will be way closer than that to Mt Eden West and you won’t need to go back up to the surface either to get your transfer train which means faster moving around. So if you say why Mt Eden East? why not also call Graftons existence into question too as that is “too close” as well to its neighbour station.. Yes it seems that AT were so keen on banking the time saving for southern line travellers that removing a station offers that have not seriously considered east facing platforms at Mt Eden. Yes they do look difficult to provide especially because of the curve, but think of the opex saving and operation clarity and simplicity of not having to run any west/south service…? Then more trains and slots for lavish frequency which would reduce actual real world travel times, not just those of the models which seem to both over penalise for transfers and not count longer waiting of less frequent services. It seems to me that AT were just keen on banking the savings from not building Newton station full stop. They could stack the in and out tracks for the Eastern CRL link on top of each other in separate vertical “boxes” (which they have to do as the “to Britomart” link has to go under the existing Western line/West CRL tunnel to merge with it), then use the “wider” curve alignment they need on the “To Britomart” Eastern link as well to have a flatter curve for both stations, except the Eastern platforms are vertically rather than horizontally separated. (they may even be able to build a “wide curve with a flat middle” where the station can go. Even if they had to they could put a slow “Vector Arena” curve at each end of the station section to give them the flat section they’d need. It would still be not much of an issue as the speed there would still be way faster than the Vector curve, and it precedes/is right after a station so the train will slow there anyway. And after all isn’t that station on the curve thing exactly what they’re doing for Mt Eden West station after all? And as for the running pattern, yes the higher Capex of this layout will come back in spades with lower Opex and ensure trains are kept free for use elsewhere. As as each extra train costs $15m if you can maximise/make best use of those as well you’re doing better again. Still as it is we get at least one line where tunnel entry and exit will able to be at speed…. or at least at whatever speed over cautious train control allow…. I can’t believe these tunnels are still going ahead. Auckland City’s density just doesn’t warrant it (the need to go underground), and the roads – soon to be free of cars (In about 20 years) are wide enough for trams, light rail, or trolley buses. It’s ridiculous. Trams were and still are the only solution. Imagine Queen street – no cars, just people and trams. And trees. Why not build a tunnel under Auckland for cars and trucks. Or heavy gauge rail moving containers. Why do the people have to go underground. A tram fan with a tunnel phobia…. oh well. As someone in the northern hemisphere who is following this CRL issue with great interest, the benefit of the CRL to your city’s exponentially increased mobility at a relatively small cost is so painfully obvious that I have a tough time understanding how the Elliots of NZ cannot see this. According to Elliot’s reasoning you all should sit tight and wait for the roads to clear in 20 years and then everything will be right as rain. Problem solved! Indeed, WHY DO people need to go underground when Elliot’s “tunnel under Auckland” (whither and whence?) will make room for all these driverless cars and trucks coursing through it/them? And I find this proposal for heavy gauge rail moving “containers” rather intriguing. I do think Elliot has a firm grip on what’s need to be done! Needless to say that the Uptown Precinct is gutted. Yet again the area has been let down by AT. Something I can’t understand as the projected population growth is much higher here than in other Urban fringe areas like Grafton, K Rd, Parnell et al. Projections are for $26,000 more people residing and/or working in the area by 2032. The Mt Eden station is in a badly served ravine that no one in their right mind would use just like the current station isn’t. I know because I used to catch a train to there for work and I was usually the only one as it is miles away from any thing. Time and motion studies have shown that an 8 minute walk is the maximum distance that the majority of people will walk to their destination and that is without steep inclines. How will our locals be served by PT we don’t even have the Link bus. Deb do you mean upper Symonds St? It’s true that the Link doesn’t go through there but a huge number of buses do don’t they? Admittedly they all head to the city but then isn’t that what the train will do too? I agree that the station would have been good to have there but I’m not certain that it would have completely transformed the value of the land and therefore stimulated development as if the quantity of bus service there is now hasn’t done it. What I mean is it appears it’s not a lack of PT connection that is holding the area back but rather the way the roads are just traffic sewers, especially Newton Rd, and the severance of the northern end of Newton caused by the motorway, that are the problems. Work on these two problems would be what I’d demand form AC and AT. Road severance is a major issue I agree and something that this station could have been a catalyst to change. As it is I’m guessing AT would be doing a thing to remedy that. Bus connectivity is fine if you’re travelling to Britomart, otherwise the area is pretty much a black hole, difficult to access from places like Ponsonby on PT, hopefully the new network will go some ways to solving that. However, I do think this is a major failure by AT, driven by the desire to save peanuts off the total cost. We’re talking the amount of money National signs off on for exploratory works on a motorway, or an extra lane on a motorway. Disappointed. Well there are proposals to direct New North Rd buses down Khyber Pass to Newmarket, in order to vary the train/bus offer, reduce the number of buses in city, and are a way to compensate for loss of west/south interchange at Newton/ Mt Eden. The lack of any bus route across either the Bond St or Newton Rd bridges is the cause of the disconnect between Kingsland Newton and Grey Lynn/Arch Hill/Ponsonby. But both are hard nuts to crack. Buses gasping up Bond St would be pretty horrible, but I guess Sandringham Rd buses could, then head up GNR and into city? I’m sure it’s been looked at, what would that do to the speed of the route i wonder? Would be great for cross town connectivity…. The RPTP has a connector route (30 minute headway) planned here, at least: Wynyard Quarter / College Hill / Ponsonby Road / Bond Street, then via Valley Road, Mount Eden shops, Remuera and Orakei Station out to Mission Bay. Again no mention of Uptown. I find it particularly galling that a Wynyard Station is planned to go along with their link connection. For what a harbour crossing that may or may not start in 2020 to service an IT sector that is being built? That is what you might call the ‘middle link’. Got a colour for that in mind? Through i suppose at that freq I guess it doesn’t qualify as a ‘link’. Yet again we have not had mention of this but I expect that is just spin anyway. I can’t see any of these routes being added. Deb the New Network is being implemented, and they’re part of that process. Don’t know exactly what’s proposed for Symonds St, but things will happen. I agree though it’s frustrating just how long it takes, but there’s a lot in it, including physical infra changes and consultations with groups that often have conflicting views. > find it particularly galling that a Wynyard Station is planned to go along with their link connection. It’s not a rail station in Wynyard. It’s a bus interchange where about half of the isthmus buses into the city will terminate, and it allows transfers to the Northern Busway buses. > Got a colour for that in mind? Through i suppose at that freq I guess it doesn’t qualify as a ‘link’. Maybe a fruit salad scheme? It’s 20 minutes all day weekdays, but I’d expect it to be just as popular (if not more) in the evenings and weekends if it had service to match. > Yet again we have not had mention of this but I expect that is just spin anyway. I can’t see any of these routes being added. That is exactly what an outsider looking in would say. It is ridiculous to suggest the that we try to sort out Khyber Pass as this issue is caused by the motorway which we can’t move. This disconnect was bridged previously by buses which the train route would rectify the cancellation of. Why would you possibly think we were talking about route duplication? Not being part of the area you can not understand just how much AT decisions have screwed things up for the locals. While it appears that we have plenty of buses about five years ago the Central Connector Route across Grafton Bridge was introduced this not only change Upper Symonds St from an interchange to a through route, it reduced bus movements by approx 5,000 movements per week. There are no longer useful connections to Newmarket and Parnell, as well as severing connections the north shore, eastern and southern direction in the process forcing the public to go into Britomart to change routes. The routes that remained are from the same general area and most people no longer get on an off here. Train stations need to be where the people are and congregate. As you can see by my example above they are economic drivers there is absolutely no point building it where there is no shopping to serve the commuters and where there are limited housing stocks and a long steep walk. Look at many of the stations on the Southern line. Orakei to service the old Seagrams bottle factory (gone), Meadowbank for Port Workers, Southdown for the meat works (gone) all build to suit employers rather than public, and no longer of much use unless you drive there. It is despicable that AT started doing back room deals on this change in February and only told Uptown about it on the 30th of August, then told the Mayor, Council and newpapers the day after that central government liked their idea. Again typical of AT to present a fait acompli with no consultation. Should be an edit function. Further’ the elimination of the train station from Symonds Street, while it contributes to a fairly major reduction in public spending which may make the difference in terms of getting central government backing for the CRL project, may later prove to be one of those decisions which end up costing more in the future, rather like building motorways with only 2 lanes in either direction and having to make them larger at a later date at an even higher cost. Yesterday I learnt why Newton Station dropped off too close to buildings. I’m pretty sure AT still own all the properties they purchased, too. Yeah it was really disappointing, I do hope AT make Burleigh St, Mt Eden Rd and Upper Symonds St more pedestrian friendly so it’s easier for people living in/working in/visiting Newton to access Mt Eden station. Its annoying having to walk up the hill and cross without a crossing and dodge vehicles exiting driveways etc. I understood it was due to the depth of the Newton Station causing engineering issues. The site at 160 Symonds St at the corner of Glenside Crescent has become available as the building have been demolished due to weather tight issues. This site could be a solution to the engineering issues due to being lower down. It is zoned business 8 because it was originally supposed to be the Casino site. The inter city bus station could be sited above ground to interchange with the underground train station. The solves the issue of relocating the current inter city bus station for which AT has been scouting around for quite a while (so I hear) plus gives a bus connection with out further impacting the CBD and gives true loop connection with the trains with out having to change between the Southern and Western routes.